What are Kachina Dolls? A Kachina doll is a carved, painted, costumed doll made by Southwest Native Americans, primarily the Hopi tribe. The dolls are dressed in the costume of a particular Hopi spirit and the dolls are usually presented to a child as a gift. The purpose of the dolls are to teach children to identify the various spiritual figures depicted by the costumes of dolls and the symbolism of their regalia. 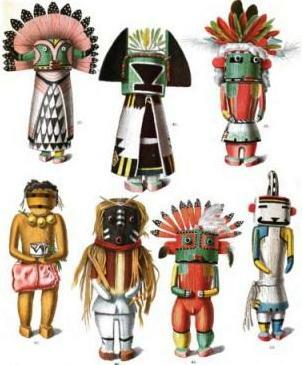 "Kachina" is a Hopi term that means a variety of things and can refer to spirits, dancers and carved dolls - refer to Kachinas for additional information. 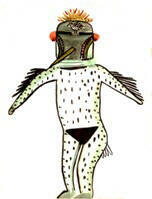 Kachina dolls are made to suit the ages of the children. The materials and construction of a doll will be suited to babies, toddlers and the older children. 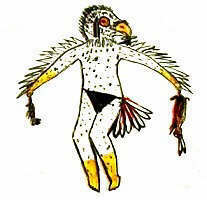 The following pictures depict drawings of some of the oldest forms of Kachina Dancers drawn by Hopi Indians. 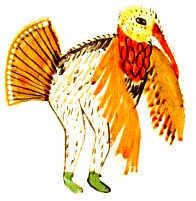 For full description refer to Hopi Kachina Meanings.